The human emotion of fear is the only constant in the market. Bull markets do not die of fear. Bull markets die of euphoric confidence. We present and analyze several market sentiment indicators and confirm the absence of euphoria. Bull Markets do not die of fear. Bull markets die of euphoric confidence. In this piece, we present several indicators of market sentiment and show that there is little confidence and certainly no euphoria in today's market. Our working hypothesis is that the only constant factor in the market is the human emotion of fear - fear of losing and fear of missing out. Other factors, such as news, both financial and geopolitical, affect the markets in inconsistent ways (if at all); sometimes, good earnings news moves the market up, but often it does not, and the same goes for geopolitics. Human emotions are hard-wired into our species, with fear being the dominant survival instinct, and this fear leaves repetitive patterns in the pricing history of the market, which help us to understand where in the market cycle we find ourselves. The American Association of Individual Investors (AAII) does a weekly survey of its members where they are asked whether they feel the market will be higher, lower, or unchanged six months into the future. Despite this being a self-reporting survey, there are some useful, repetitive patterns that form in the data. 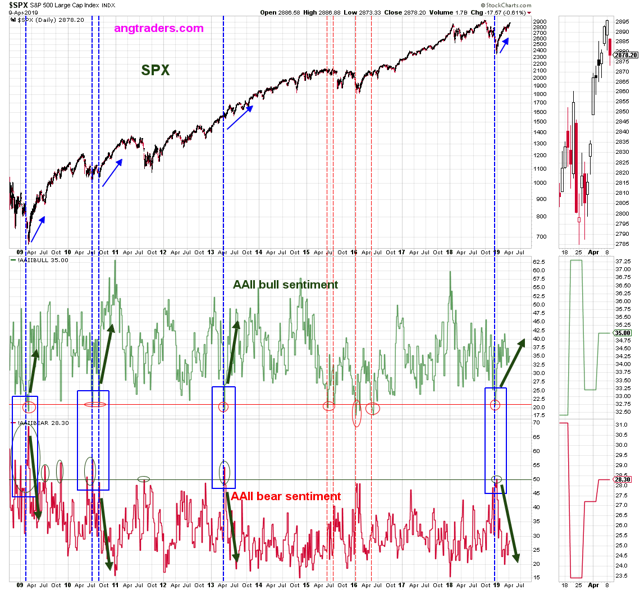 The chart below shows that market tops correspond with bull sentiment above 50% and bear sentiment below 30% (i.e. confident investors), while market bottoms occur most frequently when the situation is reversed; spikes in bull sentiment correlate with market maxima, and spikes in bear sentiment correlate with market minima (chart below). Focusing in on the data since 2009, we see that the bear sentiment has reached the 50% level, at the same time as the bull sentiment dropped below 21%, four times (chart below). 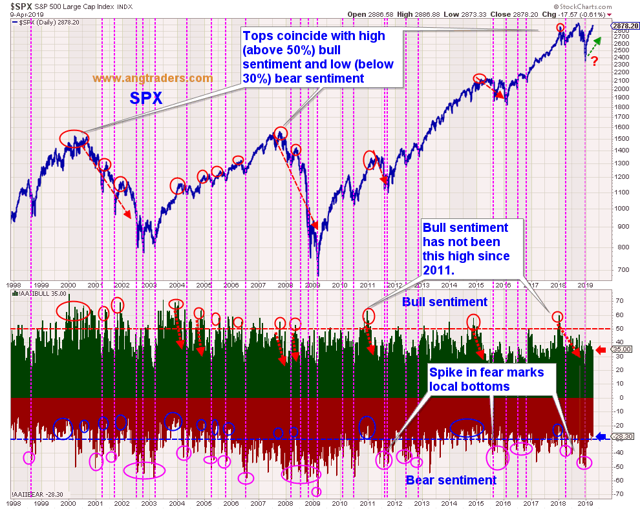 Each time this level of fear was achieved, the market rallied (blue arrows on the chart). This level of fear correlates with market minima, not maxima. The National Association of Active Investment Managers (NAAIM) exposure index measures the exposure to equities by investment managers and, therefore, the sentiment of professional investors (as opposed to the individual investors of the AAII survey). The NAAIM index is quite volatile at short time scales, so we smooth it out using a 50-week moving overage (blue curve on the chart below). 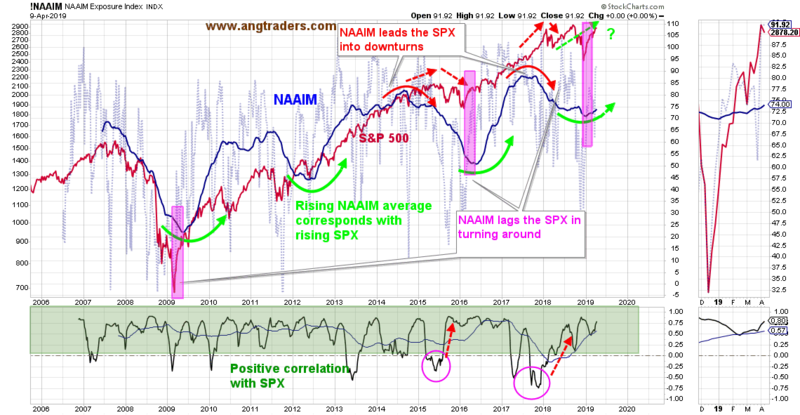 NAAIM is a leading indicator of corrections, it is a lagging indicator of recoveries; the 50-day MA starts dropping ahead of the SPX (red arrows on the graph below), but it lags the SPX during recoveries (green arrows on the chart below). According to this pattern, the SPX is only starting its recovery rally. 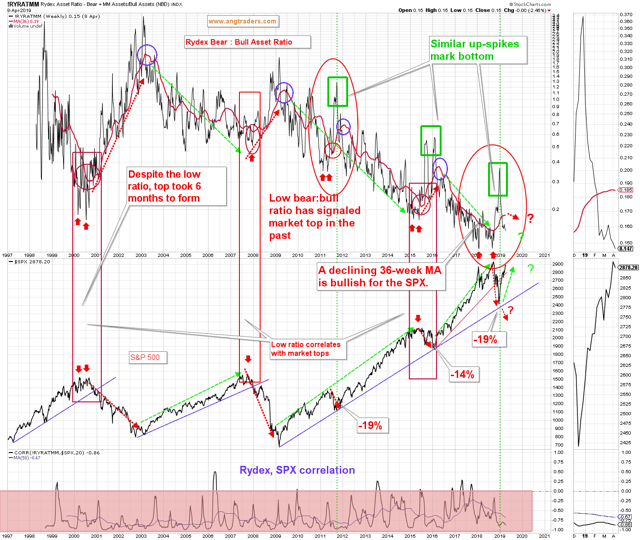 The Rydex family of funds asset allocation is useful as a sentiment indicator because it does not rely on self-reporting like the AAII or NAAIM surveys do; it simply reports how investors are allocating capital. We like to track the bear-to-bull ratio of asset allocation because it has a strong negative correlation with the S&P 500 and a distinct pattern at turning points in the market. 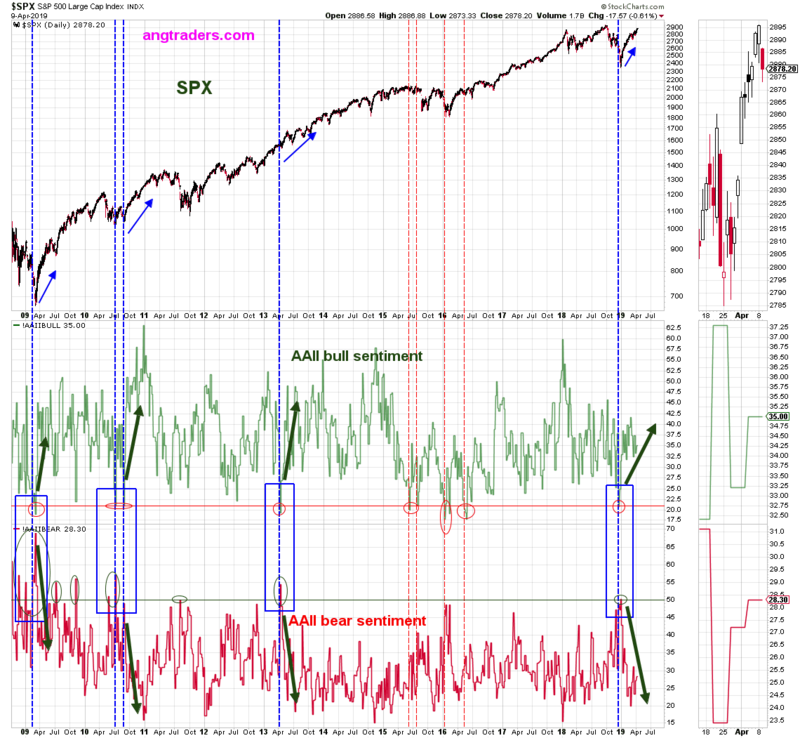 Market tops have been characterized by a down-spike in the nominal ratio, combined with an upturn in the 36-month MA, while market bottoms (both major and minor) are marked by up-spikes in the nominal ratio and eventual downturn in the average (chart below). The nominal value has just completed an up-spike, like it did at the 2011 and 2015 lows and, although there could still be a second up-spike like in 2015, the 36-week MA has started to turn down, which would confirm the local bottom in the SPX. According to this sentiment-based pattern, the market is coming off a local bottom, not forming a top that would end the bull market. In conclusion, the sentiment indicators are displaying patterns that have, in the past, correlated with market bottoms, not market tops. During the 2018 Q4 market correction, our analysis showed that we were not at the start of a new bear market and that the bull market, despite being a decade-old, was not in the process of ending. As a result, our subscribers did not panic and avoided the losses that come from selling into a correction within an ongoing bull primary trend. Let us keep you on the right side of the market's primary-trend and Away From the Herd. We invite you to take advantage of our 20% discount and 14-day free trial.